Tips For Cleaning and Maintaining Dance and Cheer Clothes - Kate's Blog about kiddies! Thousands and thousands of different children, teenagers and adults alike enjoy the many benefits of cheerleading and dance. It keeps you fit, lets you meet new people, and can be a lot of fun. You might even performance in front of an audience and get to show off your skills! However, while your skills are of course important, part of the performance is how you are dressed. Cheer and dance uniforms are often very elaborate and full of bright colors and patterns. As a result, it is important that you keep your cheer and dance clothing in tip top shape for your cheer team, and here are a few tips to ensure you can always do that. The first step to ensuring your cheer and dance team clothes are maintained and cleaned well is to use a high quality detergent. Often, these uniforms are quite delicate and require specific washing techniques, and some detergents might be too harsh or not offer a satisfactory amount of cleaning. These uniforms often get full of sweat, dirt, and other debris which can obviously degrade the condition of the clothing if it’s not dealt with. You should look for a detergent that can clean all fabrics, fights stains, and is biodegradable. Also, fabrics have changed over the years, and you need the right detergent to clean them effectively. As mentioned, dance and dress uniforms can be made from all different types of materials and different materials require different washing techniques. As a result, you should know exactly what your uniforms are made of so you know exactly how they should be cleaned and washed. Normally you can tell by feeling the fabric, but if not, you could look at the tags and they should tell you. Many tags also include washing instructions, so it makes it easy to know exactly how you should clean your gear. The last thing you want to do is wash something in a way that could potentially damage it or not get it as clean as possible. If there are no tags and/or you can’t identify how you should wash the clothes, the internet should be able to help you figure it out! When it comes to drying clothes, most of us simply put clothes in the dryer. It is fact and for some clothes, is perfectly fine. However, high heat can cause clothing and uniforms to shrink, can help set stains in and fade colors over time. Because of this, hanging your clothing to air dry is generally is a good idea. This is especially true when we are talking about cheer, dance and sports uniforms. These often are not only made from sensitive fabrics, but are also quite colorful and bright, so any color fading would be terrible. Also, shrinkage is terrible as these types of clothes are generally made to fit quite tightly, so any sort of shrinking might make them unwearable. 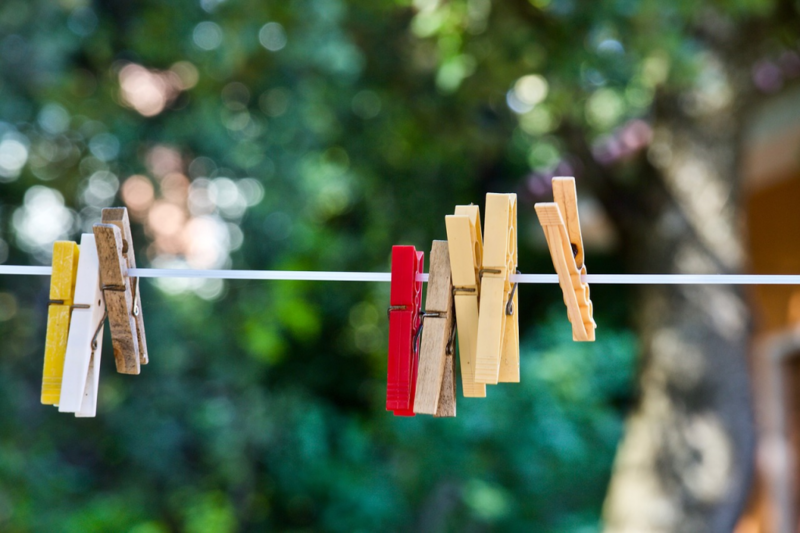 So if you have the time, you should be sure to let your clothes air dry, as it will keep them in good condition for as long as possible. While you dance or cheerlead with a team, the uniform itself doesn’t do well with others. As a result, you should be washing your uniform alone or with other fabrics that are quite similar. It should not be washed with your regular laundry for a number of reasons. One big reasons is that you don’t want the colors of the uniform (or colors of your other laundry) to run at all. Another reason to wash your cheer or dance uniform alone is to prevent cotton lint from coming off certain clothing and getting stuck to the various decals on a typical uniform. When washing, you should use cold water to make sure no colors run at all, as well. Plus, it is more efficient. In conclusion, keeping your dance or cheer uniform clean and maintained is incredibly important in both how you present yourself and extending the longevity of the uniform. How costumes look during a performance is incredibly important and could be the difference between a successful recital or competition and one that could have gone better.